From Marissa Mayer to Wendy Davis: Professional women can't win the fashion wars. Women: Please Don’t Be Stylish. Also Please Don’t Be Frumpy. Texas state Sen. Wendy Davis at the National Press Club in Washington on Aug. 5, 2013. Looking good is wrong, but so is not looking good. Anna Holmes has an essay up at Time about the infuriating bind that professional women continue to live in, where the way they “do” femaleness is always and forever going to be part of how they are judged on doing their actual jobs. You can’t just neglect your looks, because that will be held against you. On the other hand, to be a fashionable woman, like Yahoo CEO Marissa Mayer, means taking the chance that you’re going to be dismissed as less-than. “[W]omen who take an active interest in fashion and beauty are to both be commended (personal grooming is indicative of self-respect) and humored (personal grooming is superficial),” writes Holmes. The recent attacks on Texas Sen. Wendy Davis demonstrate how the game is rigged against women. Davis has perfected a 21st-century version of Texas stylishness, which immediately was held against her by her anti-choice opponents, who like to call her a “Barbie,” as if being beautiful and pulled-together automatically makes one as mindless as a plastic doll. 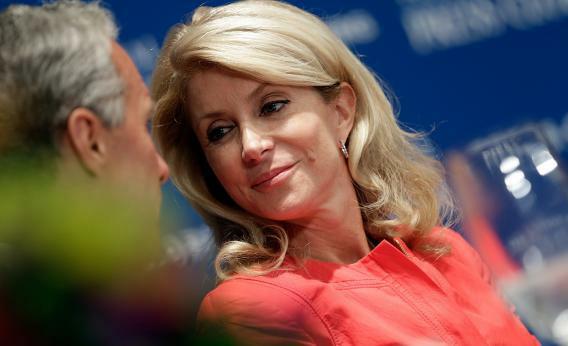 Erick Erickson is quite fond of calling Davis “abortion Barbie” and Texas gubernatorial candidate Greg Abbott thanked a supporter on Twitter for calling Davis “retard Barbie.” (Abbott later walked it back a little, but only about the language, not the gross misogyny.) Here’s a question: Does anyone doubt for a single second that Davis would be getting more respect if she were homely? Of course not. That’s when the narrative about how feminists are just bitter because no men want them kicks in. Indeed, one attempt to discredit Davis was to claim she was secretly ugly. What this all comes down to is a continuing cultural discomfort with the mere existence of women in powerful positions. As Holmes says, “Women’s work—and the work of being a woman—are perceived to be at odds.” Even though the feminist project has been underway for decades now, plenty of people still view women doing work, especially nonservice work, in the same boggled way that you look at a dog walking on its hind legs. Is it still a dog? How can this be? This is probably just a problem that will work itself out over time, as people endure having to accept that one can both be female and be a person who has an important job unrelated to sexual functions. Until then, however, there will continue to be a strange fascination with the way powerful women look, as if succeeding or failing to clean up a certain way was their job.